Here what our Best of Show ISTE judges had to say about their favorite products from the show floor. 2 What’s the Difference between Educational Technology and Learning Science? Christine Willig, president of McGraw-Hill Education’s K-12 group, discusses the science of learning. The new white paper, “Digital Teachers, Digital Principals: Transforming the Ways We Engage Students,” explores how schools are creating learning experiences that develop college, career, and civic readiness skills. Tech & Learning advisor and learning space expert David Jakes discusses the pedagogy behind transforming learning environments. ISTE attendees tweeted and retweeted 149,000 times using the #ISTE2015 hashtag, uploaded 3,545 #ISTE2015 photos to Instagram, and all social media content using the #ISTE2015 hashtag reached more than 32 million people worldwide. At the #HackED15 pre-conference session, Peggy Sheehy explained what she is doing to create an environment that inspires fun and meaningful learning. Pernille Ripp lists her favorite events from the conference. This graphic breaks down the most popular topics at the conference. Soledad O’Brien gave the opening keynote, Jack Gallagher spoke during Tuesday’s keynote session, and Josh Stumpenhorst delivered the closing keynote session. 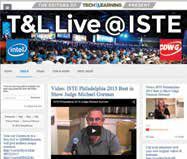 For the second year, T&L awarded some of the best products at ISTE 2015.